Inside the Democratic Congressional Campaign Committee’s do-or-die battle for the House. In less than 24 hours, voters in central Ohio will begin casting ballots in a special election to replace retiring Republican Rep. Pat Tiberi. Although Republicans have controlled this seat for nearly four decades, recent polling shows the Democratic challenger, Danny O’Connor, trailing by a single point, presenting the tantalizing possibility of a big upset in Trump country. Wearing jeans and a blue button-down shirt, Sena has a beefy frame and an easygoing rapport with his staff. Together, they begin hashing out their game plan. Setting expectations in the press, Sena agrees, is key; after all, in a district with about 100,000 more Republicans than Democrats, a narrow loss is really a victory. “Basically the entire battlefield,” Sena says, “is better than Ohio 12.” Let’s pay close attention, he continues, to voter participation in the most heavily Democratic areas, looking for signs of increased enthusiasm. And you know what? Win or lose, let’s do a postmortem focus group with former Trump and Romney voters who supported O’Connor. But the same forces powering the potential “blue wave” have also complicated life for the DCCC’s leaders. Disgust for the reality show president has inspired a record number of Democratic candidates—more than 1,300—to enter House races, a spike in political activism that created a minefield of messy primary battles. And the committee’s at-times aggressive support for centrist candidates over further-left contenders has outraged grassroots activists and escalated the broader ideological clash between the Democratic establishment and its newly empowered progressive wing. “The DCCC has begun an all-out war against progressives,” Saikat Chakrabarti, the executive director of Justice Democrats, said in March after the committee took steps to discredit progressive candidate Laura Moser in a Texas primary. Chakrabarti called the DCCC’s tactics a “completely incompetent strategy that will guarantee more losses.” Left-leaning critics have blasted the committee for what they view as its preference for candidates with high fundraising potential and middle-of-the-road policy views—a campaign playbook that, progressives argue, Trump’s election made obsolete. Others say the DCCC has neglected female candidates, particularly minority women. Dan Sena, executive director of the Democratic Congressional Campaign Committee, is interviewed in his Washington office. After the 2016 election, Rep. Ruben Gallego (D-Ariz.) summed up what many Democrats were thinking. “That staff of the DCCC, starting from the top, and almost all the way through middle management,” he vented to reporters, “has been nothing but bureaucratic and ineffective for many, many years.” Critics contended the committee relied too much on big-money donors, was slow to adopt the digital fundraising and organizing tactics that had become the backbone of modern campaigns, and lacked an effective ground operation. House Democrats nevertheless continued to back the DCCC’s chairman, New Mexico Rep. Ben Ray Luján, eventually electing him to remain in his post for the 2018 cycle. The month after Trump’s election, Luján promoted Sena, then the committee’s deputy executive director, to the top job. Like Luján, Sena had grown up in a bilingual family of prominent New Mexico Democrats; his father had chaired the state’s party. 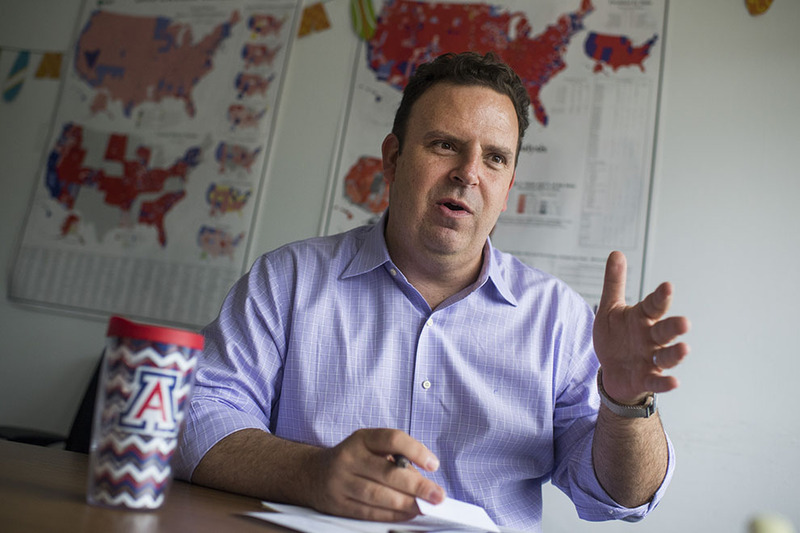 After starting his career as a volunteer canvasser, Sena scrapped his way up the food chain, landing senior campaign positions with the Democratic Governors Association, presidential hopeful and former New Mexico Gov. Bill Richardson, and New Mexico Sen. Tom Udall. Upon forming a leadership team, Luján and Sena understood that in addition to Trump’s low approval ratings, historical trends would favor Democrats in 2018; the party that doesn’t control the White House usually outperforms the opposition in the midterms. But after a top-to-bottom review of the DCCC’s efforts in 2016, the two men came to a conclusion similar to that of their outside detractors: the Washington-based national party machine hadn’t adapted to the times. “We have had to develop this entire new playbook,” says Sena. Sena tripled the committee’s digital budget to improve its grassroots fundraising reach. The committee launched an online ad campaign to expand its email database, plowing nearly $3 million into the effort. Although the panicked tone of these “URGENT” emails has annoyed recipients—BuzzFeed News called them “spammy, fear-based communications”—the strategy has proved effective. Supporters who joined the DCCC’s email list during this acquisition spree had donated nearly $9.5 million to the committee as of September 1. And today, almost two-thirds of the DCCC’s contributions are $20 or less. These organizers, DCCC officials say, helped local resisters arrange protests, attract media attention, and channel their frustration with Trump toward their GOP members of Congress­—efforts that, Sena says, pressured some Republican incumbents into retirement. “I think that got Royce out of the race. I think it got Issa out of the race,” he says, referring to California Republicans Ed Royce and Darrell Issa. The cooperation has impressed grassroots activists like Adrienne Lever, the political director of Swing Left, a progressive group designed to help Democrats take back the House. Lever says her organization worked closely with the DCCC in the run-up to California’s so-called jungle primaries (where the top two vote-getters advance, no matter their party) to avoid a nightmare scenario in which no Democrats appeared on the general election ballot. In the weeks before the June primaries, the DCCC created a phone bank tool that out-of-state activists used to call California voters, provided lists of addresses for local activists to canvass, and deployed additional operatives to support the volunteers on the ground. Meanwhile, the DCCC threw its support behind candidates who its leaders believed had the financial wherewithal, local support, and campaign infrastructure to flip GOP seats. As of mid-September, of the 80-plus candidates in the committee’s red-to-blue program, which provides fundraising and organizational assistance to strong contenders, half are women, including Angie Craig, a manufacturing executive who was raised by a single mother in a trailer park, put herself through college, and is now running neck and neck with Republican incumbent Jason Lewis in Minnesota’s 2nd District. About a quarter of the candidates are veterans, like State’s Attorney Brendan Kelly, who’s locked in a tight race with Rep. Mike Bost in Illinois’ 12th District. The DCCC’s strategy in many races has been to steer clear of discussing Trump’s antics and to avoid calls for his impeachment. Instead, it has focused on how the administration’s actions have affected districts. “This is a huge lesson from 2016,” Sena says. “It’s not about [Trump’s] character, it’s not about his wackiness. It is about how [he] impacts people’s lives.” After the guilty plea of Trump’s onetime lawyer, Michael Cohen, and the conviction of his campaign chairman, Paul Manafort, the DCCC made the Republican “culture of corruption” a theme in certain districts, like those of Rep. Duncan Hunter, the Californian charged with misusing $250,000 of campaign cash, and Rep. Scott Taylor, a Virginian whose campaign is being investigated for election fraud. A DCCC digital ad, unveiled in October, takes aim at the GOP tax bill. The most glaring change to the DCCC’s approach, however, is the sheer number of races it has jumped into. In 2016, the committee provided financial backing to 28 candidates; this year, that figure could reach 65. It’s “definitely the largest battle zone that we’ve had in over a decade,” Luján says. The last time the DCCC successfully engin­eer­ed a takeover of the House, in 2006, the committee initially struggled to field candidates. “We were begging, borrowing, and pleading candidates to run,” says John Lapp, then the DCCC’s executive director, “just to get enough surfboards in the water so that if a wave came we could take advantage of it.” But while the recruiting climate is favorable today, Sena’s DCCC must overcome obstacles that Lapp’s committee never faced. Changes to campaign finance laws have given rise to outside spending groups, like super-PACs, that have diluted the influence of national party committees. In years past, “the official party structures could anoint or defeat candidates by turning on or shutting off the money,” says Nathan Gonzales, the editor and publisher of Inside Elections. “Now there are other aven­ues to raise money besides going through the official party apparatus. Bernie Sanders was not the choice of the official Democratic Party, but he had no problems raising money.” And just as social media has helped outsider candidates fundraise, the resistance groups that formed after Trump’s election are offering strategic guidance and organizational support to progressive contenders. Still, with a record fundraising haul of $191 million—which the DCCC has channeled into TV ads, direct mail, digital marketing, polling, field staff, and other resources—the committee’s backing can be the difference in tight primary races. But in some contests, intervention has proved controversial. Progressive leaders have assailed the DCCC for pushing aside further-left contenders in favor of moderates with greater fundraising potential. In April, for example, the Intercept published an audio recording of Democratic Whip Steny Hoyer of Maryland encouraging a progressive challenger to drop out of the Democratic primary in Colorado’s 6th District, clearing the way for the committee’s preferred candidate. On the recording, Hoyer says it was the DCCC’s “policy and our hope that we could early on try to come to an agreement on a candidate that we thought could win the general and to give that candidate all the help we could give them.” He noted, “A judgment was made very early on. I didn’t participate in the decision.” Two months earlier, the DCCC was even more heavy-handed when it released an opposition research memo targeting Laura Moser, a Democrat running in a crowded Texas primary, with the kind of broadside it typically reserves for GOP challengers. 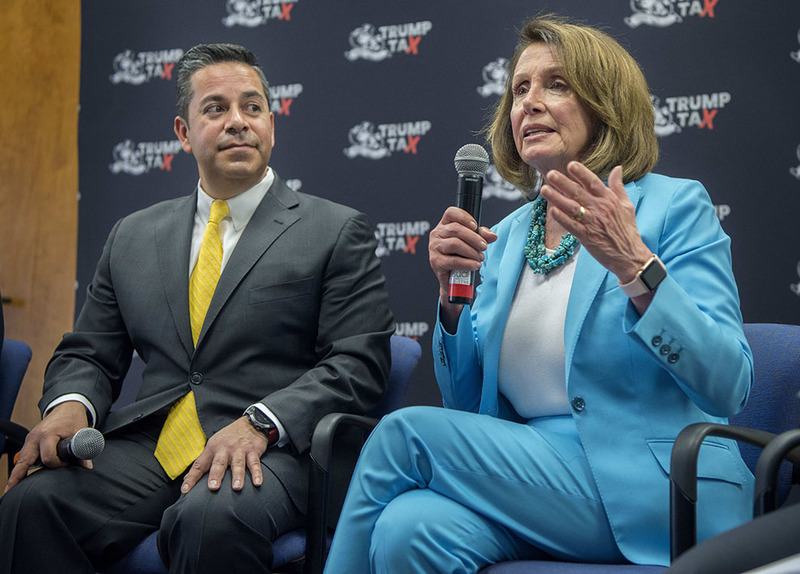 House Minority Leader Nancy Pelosi and DCCC chairman Rep. Ben Ray Lujan (D-N.M.). At the beginning of the campaign cycle, Sena says, he and his team made a pact. “We were either going to take the House or we were gonna die on the Hill doing it.” For the DCCC’s leaders, that meant backing candi­dates with the wherewithal to win in November. “You have to have enough financial resources to carry out your strategy,” says Luján. It meant embracing policy ideas that wouldn’t alienate voters in conserva­tive districts. “The way you win in West Virginia 3 and the way you win in Orange County, California, are not the same,” Sena says. “What matters is that we have fielded candidates that fit those districts.” And it meant wading into messy primary fights if they believed it would help Democrats win in November. The DCCC’s maneuvering, Sena insists, has proved effective. Ninety-five percent of candidates in the committee’s red-to-blue program won their primaries. When it comes to their progressive critics, DCCC officials are confident a victory in November will assuage any hard feelings from the campaign.